Latics loan pair to make Coasters Cup bow? AFC Fylde have bolstered their depleted defensive unit by signing Oldham Athletic duo Jamie Stott and George Edmundson on loan. They could both make an early appearance in Coasters’ colours in this afternoon’s FA Cup fourth qualifying tie at home to Wrexham. The loans run until November 11. AFC Fylde manager Dave Challinor, welcoming the duo’s arrival, said: “I think it will help that they have come in together. “They know each other and they can support each other, but I’m sure they will have no problems and that they will enjoy their time with us. “Jamie is a left-sided centre-half who can also play left-back, while George is right-sided, so it gives us a good balance and allows us to play different systems. They can both play, but ultimately they are defenders that want to defend. 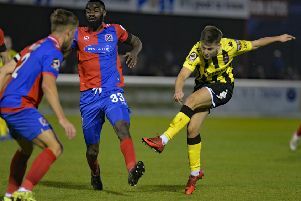 “We had very little cover at the back with just two recognised centre-halves and with one of them a doubt for the weekend, this comes at a good time,” the Coasters’ manager added. Stott, who is 19, signed professional terms with Oldham last season and played in the final four games as the Latics avoided relegation, being named man-of-the match on his debut in a 1-0 victory over Bolton Wanderers. The defender spent the bulk of the 2016-17 season on loan at Curzon Ashton, making more than 40 appearances. Edmundson, also a central defender, came through the ranks at Oldham and made his first team debut during the 2015-16 season. He had a loan spell with Alfreton Town last term before being recalled towards the end of the campaign, going on to play several games for the Latics, including four this season for the League One side. The Coasters had just one recognised centre-half available with Jordan Tunnicliffe doubtful with an Achillies injury, so it was vital to bring in reinforcements. Challinor said: “They both have Football League experience and they will want to prove themselves. “You need to be driven and motivated when you are joining a club for a short time and you tend to get that more with young players. “We had a couple of similar loans last season and they worked well and I’m sure these two will be great additions to the squad. “We enquired about George earlier in the season but he was in and around the first team. They have since had an influx of players come in and allowed him to spend a short time out on loan.